BEIJING -- The income gap between China's rural and urban residents has continued to widen during the past few years despite rapidly rising rural incomes, Agricultural Minister Sun Zhengcai said here on Wednesday. The income ratio between urban and rural residents was 3.28:1 in 2006, against 3.23:1 in 2003, said Sun in his report on the promotion of building a new countryside in 2007, delivered to China's top legislature. Sun also said the net income of rural residents in different regions also varied widely. According to his report, per capita net income for the country's 900 million rural residents is expected to reach 4,000 yuan ($546) in 2007, up 7 percent year-on-year in real terms. Rural net incomes have grown more than 6 percent annually for four consecutive years. The income gap is only one of several problems in rural areas, according to Sun's report. While listing the achievements in rural areas in recent years, Sun admitted that rural development still lagged behind urban development. 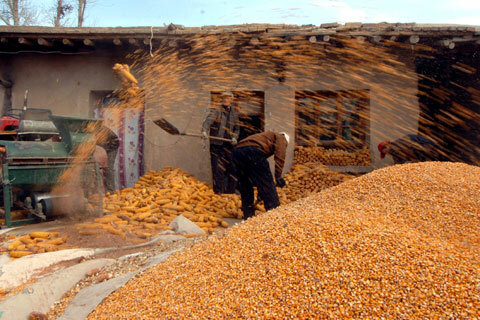 "We have bigger pressure to ensure the supply of major agricultural products such as grain," he said. "China's urbanization has been speeded up and more rural residents have migrated to urban districts," he said. "In this case, more agricultural producers become farm produce consumers, which created more pressure for supply," he said. Another problem facing China's agricultural development is inadequate application of science and technology. "Only 30 percent of scientific and technological achievements have been applied to agricultural production, which is 40 percentage points lower than developed countries," he said. Despite increased government spending in rural areas, the infrastructure is still poor and vulnerable to disasters. According to Sun, the government spent 431.8 billion yuan ($59.15 billion) on agriculture, rural areas and farmers this year, an increase of 80.1 billion yuan over the previous year. China allocated 11.38 billion yuan to promote a new rural cooperative medical care system and 27.98 billion yuan to support the new compulsory education mechanism in rural area to ensure that all citizens shared the fruits of China's reform and opening-up, Sun said. He said that the government will continuously focus on accelerating the development of modern agriculture and ensure that the per capita income of farmers increase more than 6 percent in 2008. Sun stressed that efforts would be made to raise economic efficiency in agriculture and improve production conditions next year. Also, China will continue to restructure and upgrade township enterprises, encourage farmers to migrate to neighboring areas or start businesses in their hometowns and improve migrants' working conditions in urban areas.